A new theft prevention campaign has been launched by the Metropolitan Police to reduce scooter thefts and related crimes. As part of the Be Safe initiative, the message for scooter owners is to ‘Lock, Chain and Cover’ their machine. As well as billboard adverts, the campaign will run on petrol pump screens, buses and online. The aim is to stop the theft of scooters and reduce their use in further crimes such as snatches, burglaries and transporting drugs and weapons. In 2017, more than 14,000 scooters were stolen and many were used to commit 23,500 further crimes. Many of these machines were then either dumped or broken to be sold for their spare parts. Metropolitan Police Assistant Commissioner Martin Hewitt, Territorial Policing, said: ‘We have put a huge amount of effort into stemming the rise in scooter-enabled crime, and are now seeing reductions, which is great. However, we are not complacent. All the new tactics and technology we have introduced will be backed up by really proactive policing. Other new tactics being deployed by the Met Police include using trail bikes so they can follow criminals when they head off-road. The police has also introduced tyre-deflating spikes specific to motorcycles to prevent pursuits developing, while DNA sprays put a unique mark on a scooter or motorcycle to make it harder to sell illegally. 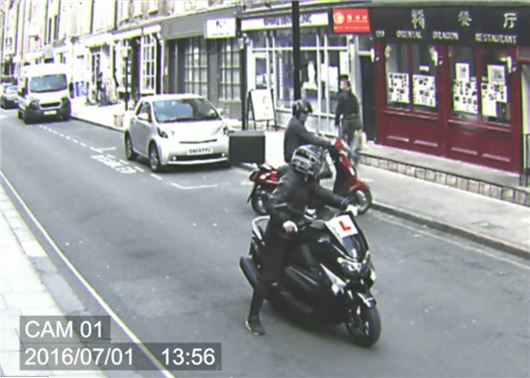 Since the spring of 2017, powered two-wheeler thefts of scooters and motorcycles has reduced by 52 per cent in London. This has had a knock-on effect of cutting crimes using these vehicles by 47 per centin the same period. Covering a bike is not a deterrent. And if you are going to buy a chain and lock, make sure it's an Almax chain and lock. Anything else would be a breeze for these thieves..